Do you think you’re an effective content marketer? If you answered yes, you may want to pause and reconsider your answer. Things may not be what they seem. To drive the point home, here’s a brief story. When my youngest daughter was a teenager, she went for a routine eye exam. There, the optometrist noticed something unusual: Excess pressure on the back of the retina, which may be caused by a tumor. My wife and I were nervous and frightened. What if our little girl had cancer? During the next several months, we met with a series of increasingly specialized doctors, ending with a pediatric neurologist. When we finally got the diagnosis, it was a frightening-sounding disorder we had never heard of: Pseudo tumor cerebrai. Like most concerned parents, we immediately focused on the second two words, which translated roughly into “brain tumor.” A tumor, as it grows, pushes other things out of the way, generating pressure, pain and other undesirable symptoms. We ignored the “pseudo” part. But we were wrong. It wasn’t a brain tumor at all, but a disorder that closely mimicked one. The pediatric neurologist explained that the pressure on our daughter’s retinas was caused by excess fluid that had built up in her spinal column. Instead of dissipating at the base of the brain, her spinal fluid was accumulating and causing increased pressure behind her eyes, headaches and other symptoms. A spinal tap and months of diuretics took care of the problem. What does this have to do with content? It’s very simple: Things are not always what they seem. You’re producing and distributing content. You’ve got a process in place to create more. You’ve checked that box. It’s easy to be lulled into a sense of complacency. But you could be wasting your time and not even realize it. 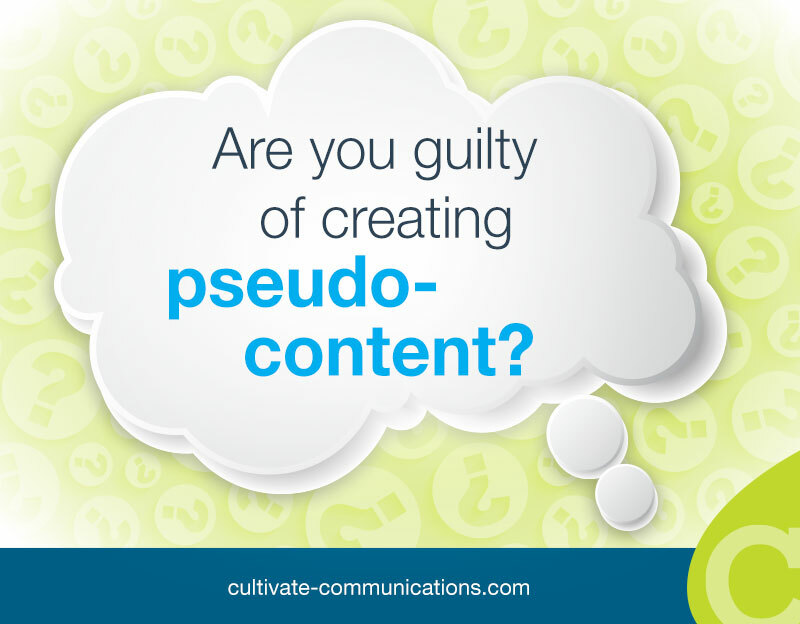 You may be unwittingly creating and distributing “pseudo-content” – content that masquerades as focused and effective, but in reality isn’t. Pseudo-content is content that you create based upon what you THINK you know about the needs of your target audience. It’s everywhere. Marketers churn out tons of it, every day, because it’s easy to produce. Ironically, it often gets ignored by the very audience it’s designed to influence. Because more often than not, marketers start to produce content without a documented strategy. You make assumptions about the needs of your target audience. You may start with a list of keywords and phrases that are important to your SEO needs, and create and publish “optimized” content based upon them. As you get comfortable with the content production process, you turn the crank faster. More content must be better, right? All of this content may not be based upon detailed buyer personas which are, in turn, based on extensive quantitative and qualitative research. It’s based upon educated guesses, which may or may not be accurate. It doesn’t map to any part of a buyer’s journey, and isn’t necessarily designed to move prospects to the next step in their buying process. It’s a set of isolated islands, orphans. As a result, your content may be somewhat targeted to your audience’s needs, but more than likely, it misses them by a mile. It doesn’t create an impact. It leaves a few ripples on social channels and disappears without a trace. Customer research to identify needs and pain points. Formulating customer personas that bring this data to life. Visualizing a customer journey map, which shows how a typical customer moves from first recognizing a need to purchasing your product – and beyond. Mapping the audience’s content needs to key points along the customer journey, which drives the development of content targeted to meet those needs. Developing an editorial calendar, which specifies what you will publish, for which audience segment, when and which channels to which it will be distributed. The bottom line is that you must create high-quality content that consistently meets the needs of your target audience. That’s the secret to making an impact with content marketing!